With over a decade of experience as a soccer player, Japanese-born Toshi Kosins ’20 knows how important it is to support his teammates. After he completes his physics degree at the University of Redlands, Kosins plans to go on to support a different demographic: medical patients awaiting prosthetics. A concern for others, respect for the discipline it takes to make progress, and a somewhat unexpected love of learning are unifying themes in Kosins’ interests on and off the field. Growing up in Hawaii alongside a twin brother, Kosins has had to adjust to his newfound independence on campus. He says that he doesn’t mind being on his own, especially with his teammates never far out of reach. 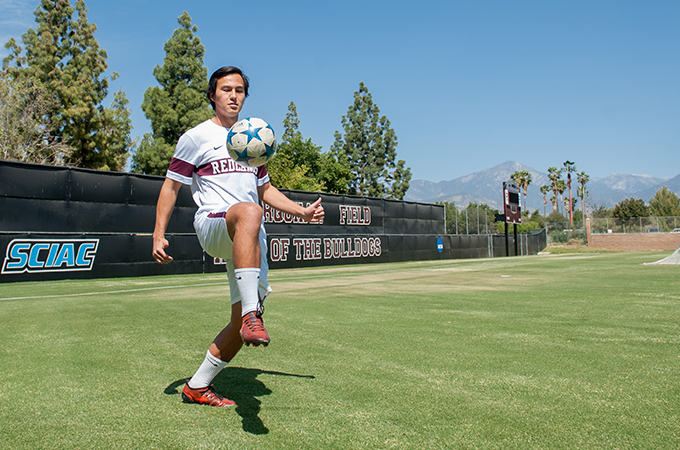 Learn more about athletics and undergraduate programs of study at the University of Redlands.